Raigad district have 240 Kms. Of Arabian Coast Line out of which Raigad Police jurisdiction contained 175 Kms. direct Coast line. There are (1) Revas (2) Salav (3) Rajpuri and (4) Bankot are major creeks in the district. Raigad police jurisdiction contained 6 coastal police stations 1)Alibag 2) Revdanda 3) Murud 4) Shriwardhan 5) Mandva coastal and 6)Dighi coastal out of which Mandva and Dighi coastal Police station are newly created in the year 2005. 1) Pangloli-Mhasla, 2) Hareshwar-Shriwardhan and 3) Dadar-Pen are proposed coastal police station vide Phase II. in the district. Amongst which 3 are on the way of becoming major ports i.e. 1)Dighi, 2)Revdanda(Ispat) 3)Dharamtar. There are 24 jetties out of which 3 are private jetties i.e. 1)Dolvi-Nippon, 2)Dharmtar-PNP, 3)Revdanda-Ispat. Also there is 26 landing points and 34 fishing boats landing points. Total coastal villages in the district are 55 and 56 villages are on creekside having 69,304 population of fishermen (Total Fishermen families – 11620). Out of which 30,044/- are actual fishermen. Jurisdiction contained 41 Fishermen Co-op-societies. There are 4,943 fishing boats in the district, out of which 3444 are mechanical boats and 1499 are conventional boats. 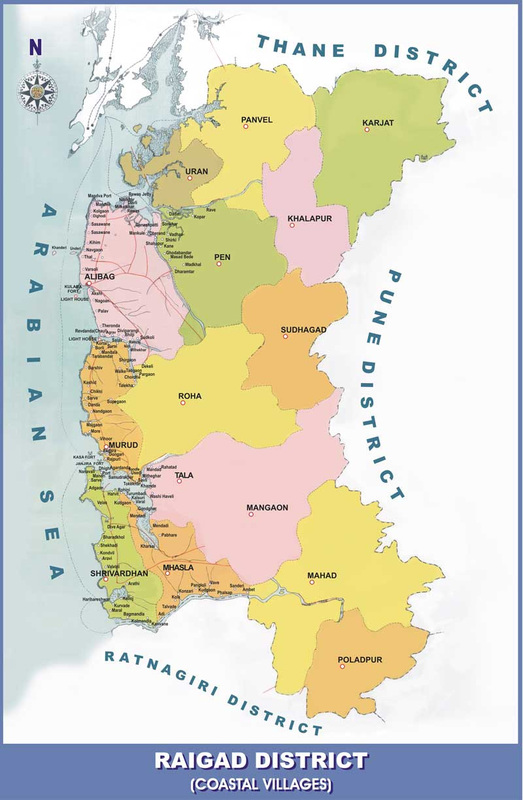 To vigil on this vast coast line of Raigad police jurisdiction, there are 12 checkpost i.e 1)Dharamtar, 2) Pezari, 3) Salav, 4) Shighre, 5) Khari, 6) Tambadi, 7)Indapur, 8) Ambet, 9) Sai-Phata, 10) Kole, 11) Shirgaon, 12) Mandad. All checkpost are equipped with fire arms and ammunition with 1 Police officer and 4 men around clock with sand banker & shelter facility. Raigad have 4 watch towers i.e 1) Dighi, 2) Shekhadi, 3) Salav, 4) Revas to vigil on coast line area equipped with arms and ammunition with 2 men each around the clock. Off shore patrolling are carried with 6 police jeep containing 1 Police Officer & 3 Men equipped with arms and ammunition and with 16 Motor Cycles having two men each equipped with arms and ammunition. Joint Sea patrolling with Navy, Custom and police are carried out with 8 boats out of which 2 are police speed boats and 6 are rental, having 1 police officer, 1 Navy Officer, 2 Custom Officer, 4 police men & equipped with arms and ammunition. With keeping in mind the concept of "Fishermen and coastal villagers are Eyes and Ear of Coastal Security" this district formed Sagar Rakshak Dal for Coastal surveillance. Now there are total 188 Sagar Rakshak Dal with 2337 active member. All members of Sagar Rakshak Dal are trained member with having periodical meetings with concerned police station incharge and Sub-Divisional Police Officer. On receipt of any alert or threat signal from any intelligence agencies, all Sagar Rakshak Dal members are sensetised through concerned police station. Taking into consideration the recent threats and alerts Surprise and sudden Nakabandies are organized on checkpost and by creating temporary barricades on coastal approach road.